· Rain: 468, each entry has five sets of Firestone’s new rain tire available this weekend. From Firestone: The Firestone primary and alternate tire specifications for Edmonton remain the same as those used earlier this season on temporary street circuits at St. Petersburg, Long Beach, Brazil, Detroit and Toronto. The specs feature updated tread compounds for 2012 applied to the same Firehawk street-course tire construction used throughout 2011. Firestone Racing has available this weekend the new-for-2012 rain tire specification that debuted last month in Detroit. The tread pattern design of the new rain tire is inspired by the Firestone Firehawk Wide Oval Indy 500 passenger-car tire. Incurring 10-spot starting grid penalties for unapproved engine changes: 12-Power, 22-Servia, 28-Hunter-Reay, 9-Dixon, 78-de Silvestro. 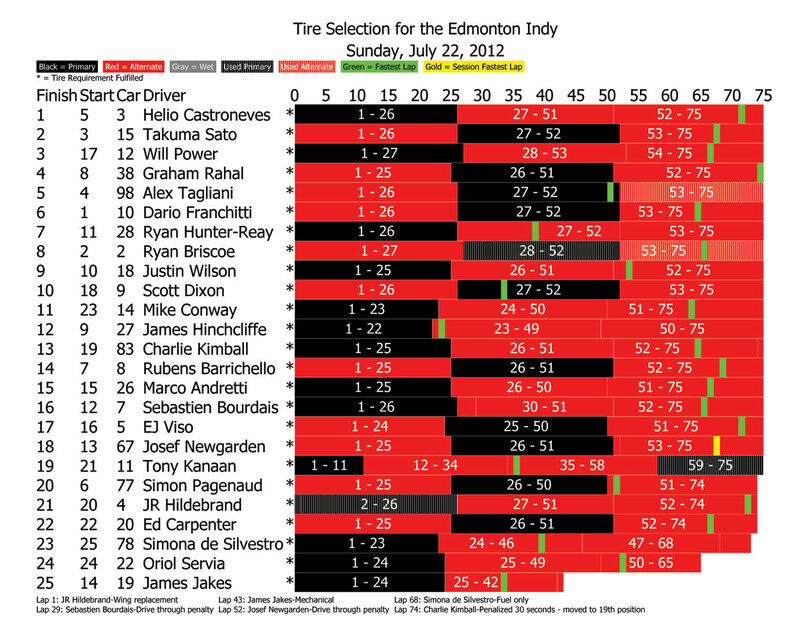 – All cars ran the Firestone Fast 6 on red tires. – All teams ran round 2 on wet tires. – ~10:00: 14-Conway stalls at pit entrance due to fuel pressure issue. – Rain began close to the end of round 1, group 2, hard at first but letting up somewhat before the start of round 2. 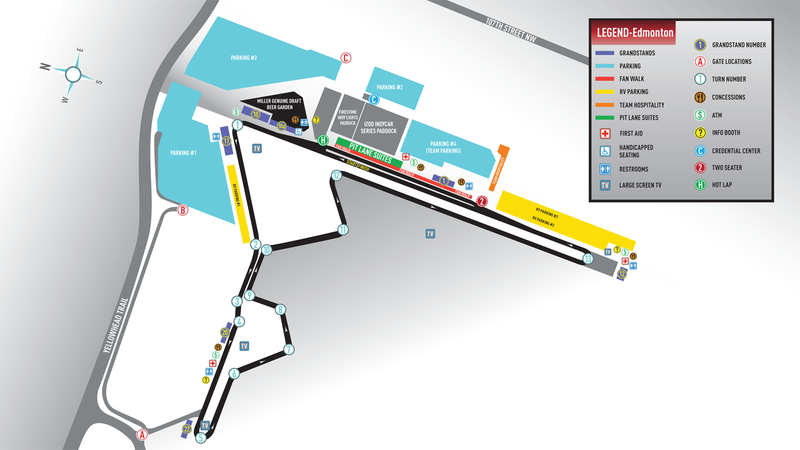 – 8:00: 67-Newgarden off course in turn 7; red flag, no damage. – 18:00: 3-Castroneves spins in turn 1; red flag, no damage. – 30:00: 18-Wilson off course in turn 13; red flag, no damage. – 20:00: 27-Hinchcliffe penalized for pit-exit violation; fastest lap revoked. – 23:00: 18-Wilson spins in turn 5; red flag, no contact. – 28:00: 83-Kimball into tires; red flag, no damage. – 43:00: 3-Castroneves spins in turn 1 avoiding 12-Power; red flag, no damage. – 50:00: 14-Conway stopped on track at turn 13 near pit entrance; red flag. – 28-Hunter-Reay was penalized for unsportsmanlike conduct against 19-Jakes. He was held on pit road for the final minutes of the session. Starting grid? Is that on TSO? Or…? Couldn’t find it at indycar.com, eother.